If you are planning to visit Machu Picchu during the high season, Ollantaytambo may become important to you. During high season it is difficult to get train ticket from Cusco. Since a good number of trains run form Ollantaytambo to Machu Picchu, you will still get train ticket from Ollantaytambo. So instead of starting of Cusco by train you have start from Ollantaytambo. Ollantaytambo is a small city. It is at the west of Cusco, and of course in between Cusco and Machu Picchu. This town is the open Museum of actual Inca town. Ollantaytambo is located at the western end of the Sacred Valley. You can reach there by bus. It is a two and a half hour journey by bus from Cusco. You can reach Ollantaytambo by train, bus, collectivo or by taxi. from Cusco. From Machu Picchu you can reach here only by train only since there is no road between Ollantaytambo and Machu Picchu. Train leaves Cusco in the morning and and takes 2 hours to reach Ollantaytambo. There are several trains. You may check my page	on trains for details. You can take a taxi from Cusco. It will take also around two hours to reach Ollantaytambo. Taxi may cost you around 25.00/30.00 $ one way. Another option is taking a bus from Cusco. It is certainly very very cheap. Bus will cost you only 2/3 $ one way. From Cusco there are few daily buses which leave for Ollantaytambo. Better option is to take a bus from Cusco to Urubamba, then change the bus and take the one from Urubamba to Ollantaytambo. A good number of buses run at these route ( Cusco- Urubamba, Urubamba- Ollantaytambo), so you don't have to wait for buses. If you are already in Machu Picchu and planning to stop at Ollantaytambo while coming back, just stop at the train station at Ollantaytambo. Train is the only way to reach Ollantaytambo from Machu Picchu. Emperor Pachacuti was the very first Inca to conquer this place. After he conquered this place he kept it as his personal state. Pachacuti rebuilt the town with sumptuous constructions and undertook extensive works. 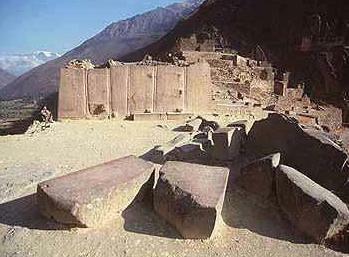 Afterwards the town was provided for lodging for the Inca nobility. Sacsayhuaman and retreated to Ollantaytambo. Then Ollantaytambo became the temporary capital of Manco Inca. Very soon Hernando came with a large force (70 cavalry, 30 foot soldiers and a good number of natives) to fight against Manco Inca. The Incas fought bravely and defeated Hernando. So Ollantaytambo had become the only place which successfully resisted the attack of Spaniards. However, despite his victory, Manco Inca did not consider his position safe. So next year he left this place for Vilcabamba which was located in deep forest. Now what you are expecting to enjoy in Ollantaytambo! Ruins, of course. The town itself is ruins of Inca periods. This is one of the few towns where the original Original Inca planning remain intact. Pachacuti started to build this town, but abandoned for reasons still unknown. This city was divided in blocks ( canchas in Quechua language). Each cancha had only one entry. Through this entry, which was a doorway made of huge stone, you can enter into a courtyard. This courtyard is a at the center of all the houses surrounding it. Another favorite visitor spot is the Temple Hill. Here you will see six gigantic monoliths walls. This unfinished wall is still a mystery. There are different reasoning why the construction was abandoned. Still we don't know whether the war between Huascar or Atahualpa, or the Spanish conquest or retreat of Manco Inca caused the the constructions halted.